I like the idea of a ranking system. Perhaps one table for every server and then one for the whole world. I also think it would be a good idea if these rankings were only based on, for example the last 5 seasons. So once the sixth season has finished the first seasons results are discarded. hmm, yes it's interesting but seems impossible if TE has 150 M' accounts. at old times there was an extra app of facebook, were we could see many of the records, achievements or titles of a club. Also could see our rank among all the other TE managers. At that point the app had a problem it was the reverse calculation. That mean I was among the 1% of TE clubs (or else, better above the 99% ). btw Jeeves and Sausy, can you ask an old dev what happened with that app ? One day all of a sudden, just stopped. HairDryer and khris like this. emblems/jerseys is something i'd prefer. looking at clubs, many of them have the same emblems amd jerseys is not realistic at all. Talking about showing off, why not allow them to show off their emblem+jerseys(created by them with more options/patterns/colors etc) or have at least 200 jerseys and 200 emblems (NOT Official football clubsemblems) at the Club Shop so they may be able to choose more than what is being offered at the moment. As a person suffering from Obsessive Compulsive Disorder like me i find it rather disturbing and boring seeing the same logos being used by clubs be it normal or premium. Emblems Jerseys would be great. If it hasn't been mentioned in this thread (it certainly has in others) I'd love a hall of fame team where you select your best team of all time from all the players you ever had. Associations needs a complete overhaul. 1) I agree with Nik that the continual swapping in and out of Associations teams during the season manipulates the draw, and needs to be stopped. There was an Association I saw in Platinum Division, in the World Top 10, that had teams with 10-20 match points each, including the Captain. How can that be if they're not swapping teams in and out every week? 3) The 100T top prize is laudable but, in the end, too much. It needs to be a lower prize, with other non-monetary things thrown in to complete the sense of achievement (I think Nik has already covered this). 4) The engine which governs Association matches seems to be different from that which is normally used. How else can you account for the fact that I lost to every lower-Quality team that I faced in Associations last season, even one -25%Q, whereas in normal play I got much better results (overwhelmingly wins) against equivalent teams. Average goals per match in Associations: 1.00; in normal play 3.08... There is something screwy in Associations-land. Last edited by talisman; 02-04-2018 at 09:32 AM. nikolgiorgos and jcohen42 like this. In associations is very easy and clear showing off your achievements. My group it's No23 in world top100 (let's say ) . You see it, it's there, can be seen by every body. 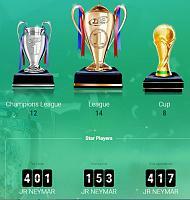 But nobody can see my 17th treble. So how about a start dev-guys ? Can we extend the LV3 Treble achievement ? Now it stop at 10 trebles. Can you make the LV4 (10 more) and LV5 (10 more ) ? khris and madflo19 like this. It's a must for us to be able to show off somehow, because in the end is our work and we all want to highlight somehow our achievement but would be great if Top Eleven can do it in a way to please most of us. Personally rather then to see Club History visible for everyone, I would prefer to see just the Trophies as it was before, but also having some commemorative Jerseys & Emblems based on time played would be great for those who play the game for a very long period of time. @khris, idea with the museum is not a bad one at all, I actually like it cause it have few good things in like making Stadium and Facilities visible again for opponents, plus of course, showing our trophies. It's not only about showing off. In my first levels, being able to see some other team's achievements was very helpful too. For example when I had a friend request from someone, I was examining his profile. If he had low level in "True fan", it was a reject from me. If me and someone else were together in some auction, I was checking his "Mogul" lv or if he had the Stubborn achievement , to avoid a bidding war against him. 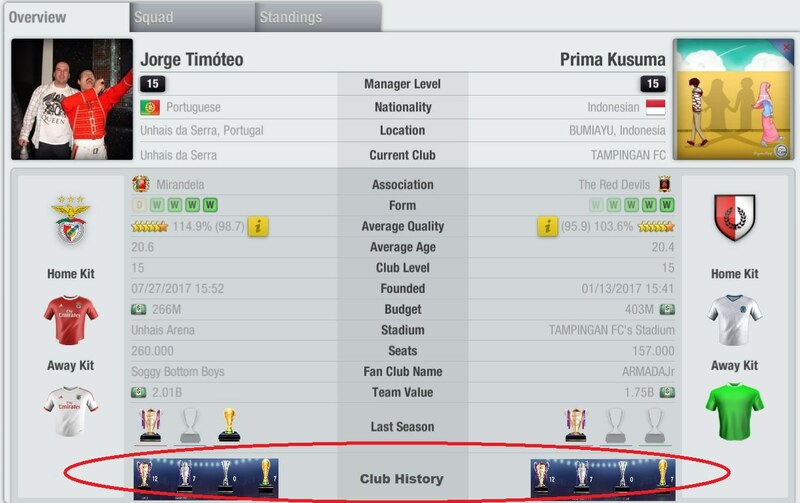 Of course now all those achievements has no meaning as I 've finished them (as all the teams of my lv) before many years. But it would be interesting (if they are visible of course), to reset or to have some current achvm. for the recent - last 3 seasons for example. Unfortunately the game goes more to visual than strategical development the last years. madflo19 and Doors FC like this. Also, why can't we have something like this? I mean, what's the point of winning titles if you can't show them off? Crvena Zvezda, IImaestroII, brunoctc1983 and 1 others like this.